New Black leather strap, 414X/A16, length 115-75, 18-16mm, with polished steel buckle. Price $150. 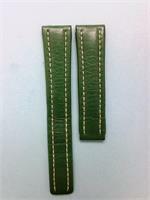 New green leather strap, 124X/A16, 18-16mm, length 115-75 with buckle. Price $150. New BREITLING Black Leather strap,16-14mm, 95-80mm, with deployment buckle,fits Breitling Models with 16mm Inlet including: Cockpit Lady & Colt Oceane. New Black leather strap, 19-16mm, length 115-75, with buckle. New Royal Blue leather strap 942X/R14, 16-14mm, 110-70, with buckle. New brown leather strap, 24-20mm, length 110-90, for deployment buckle. New Brown leather strap, 19-16mm, length 115-75 with buckle. New Brown leather strap, 19-16mm, length 115-80, for deployment buckle. New Brown leather strap 22-18mm, for deployment buckle, length 10-90. Dark plain green Leather strap, 20-18mm, 120-80mm, without folding clasp.